Henry Fonda is one of the greatest stars in film history. His appeal is both easy to understand and difficult to classify. Quiet and somewhat reserved, Fonda had tremendous presence and could unleash an understated power, which never left a doubt about his characters intentions. Stardom eluded the young actor, but eventually, every director and producer wanted what he could bring to a picture. Gangly and shy as a lad, young Henry worked for his father, who was a commecial printer. A good athelete in school, he thought of becoming a journalist, a feeling which grew after his father took him to a lynching when he was fourteen. Fonda was ever after aware of race prejudice, and was almost always on the side of the little guy in his films. He attended the University of Minnesota, but dropped out. Acting on the advice of Dodie Brando (mother of Marlon), Henry became involved with the Omaha Community Playhouse. Henry was a natural, and became fascinated by all aspects of the theatre. He played the lead in Merton of the Movies, and was such a success, that he headed east in 1928. Performing in summer stock companies, Fonda formed relationships with Margaret Sullivan (who became his first wife), Joshua Logan, and James Stewart. The two actors shared an apartment in New York as they sought roles on the Broadway stage, but as the Depression opened, the pair had money troubles (who didn't?). Fonda appeared in The Game of Love and Death during the 1929-1930 season, I Loved You Yesterday in late 1932, and New Faces of 1934 in early 1934. Fonda played the romantic lead in the play The Farmer Takes a Wife in the 1934-1935 season, opposite June Walker. When Fonda was asked to play the lead in the film version of Farmer (released in August, 1935) opposite Janet Gaynor at Fox, Fonda and Stewart (who had landed at M-G-M), were roommates once again. Fonda starred in a string of pictures at 20th Century-Fox: a remake of Way Down East (which played the Chinese in October, 1935), The Trail of the Lonesome Pine (released in March, 1936), and You Only Live Once (released in January, 1937). After appearing in That Certain Woman (released in September, 1937), co-star Bette Davis picked Fonda to play opposite her in Jezebel (released in March, 1938), which really put Fonda on the map, but he was still considered a "up and coming" sort of figure. Now married to Francis Brokaw, Henry began his family, becoming father to Jane Fonda in December, 1937, and Peter Fonda in February, 1940. Other films Fonda did as an "up and comer" were Jesse James (which played the Chinese in January, 1939), The Story of Alexander Graham Bell (played the Chinese in April, 1939), Young Mr. Lincoln (released in June, 1939), and Drums Along the Mohawk )played the Chinese in November, 1939), which placed Fonda squarley within the stock company of director John Ford. Fonda was forced to sign a long-term contract at Fox to play the part of Tom Joad in The Grapes of Wrath (which played the Chinese in February, 1940). After this amazing turn, Fonda was placed in everything that was a hot property on the Fox lot, like the musical Lillian Russell (played the Chinese in May, 1940), or the sequel to Jesse James: The Return of Frank James (played in August, 1940), or the Preston Sturges comedy The Lady Eve (released in March, 1941), or the rom-com The Male Animal (released in April, 1942). 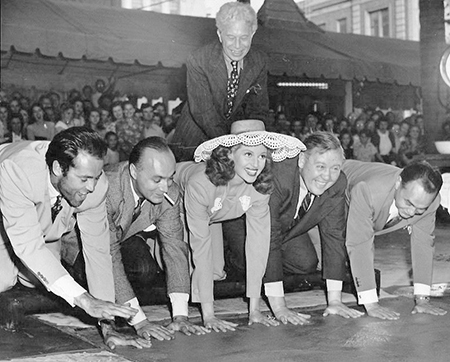 Fonda was one of the five actors from the film Tales of Manhattan to be imprinted on the same day at Grauman's Chinese Theatre. Tales would have its world premiere at the Chinese two weeks later, in August, 1942. He finished shooting Immortal Sergeant (which played the Chinese in February, 1943), and The Ox-Bow Incident (played the Chinese in in June, 1943), before enlisting in the Navy in November, 1942. He was stationed on the destroyer USS Satterlee in the Atlantic, and was later a Lieutenant Junior Grade with the Air Combat Intelligence in the Pacific (the exact same rank held by Doug Roberts in Mr. Roberts). After World War II, Fonda took it slow, working off his Fox contract with My Darling Clemintine (which played the Chinese in October, 1946), and Daisy Kenyon (played the Chinese in November, 1947). He then hooked up with John Ford's production company, making The Fugitive (released in March, 1948), and Fort Apache (released in June, 1948). Enjoying the life of the free agent, Fonda teamed up with old pal Joshua Logan for the stage adaptation of the comic novel about Naval life in the Pacific, Mr. Roberts on Broadway from February, 1948, to January, 1951. Fonda toured the nation with Mr. Roberts, then appeared on Broadway in The Canie Mutiny Court-Martial, directed by fellow Tales of Manhattan star Charles Laughton all through 1954. 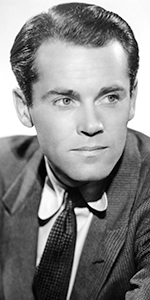 Fonda returned to the screen in the film of Mr. Roberts (released in December, 1955), which remains perhaps, Henry Fonda's signature role. Many films followed: War and Peace (released in August, 1956), The Wrong Man (released in January, 1957), 12 Angry Men (released in April, 1957), Advise and Consent (released in June, 1962, The Longest Day (released in October, 1962), How the West Was Won (released in February, 1963), Spencer's Mountain (released in May, 1963), Fail-Safe (released in Otcober, 1964), Battle of the Bulge (released in December, 1965), Madigan (released in March, 1968, Yours, Mine and Ours (released in April, 1968), The Boston Strangler (released in October, 1968), Once Upon a Time in the West (released in July, 1968). The 1970s brought a shift in roles: The Cheyanne Social Club (released in June, 1970), There Was a Crooked Man (released in December, 1970), Sometimes a Great Notion (released in December, 1970), Ash Wednesday (released in November, 1973), and Il mio nome é Nessuno (My Name is Nobody - released in the U.S. in July, 1974). Fonda returned to Broadway to play the title role in Darrow in the early 1974, and later in early 1975. He returned to the big screen in Midway (released in June, 1976), and Rollercoaster (released in June, 1977). After the Broadway run of First Monday in October during the 1978, season, Fonda retired from doing stage work. Lured back to Hollywood for such films as The Swarm (released in July, 1978), and Meteor (released in October, 1979), these films weren't great, but they got him out of the house, and the public never tired of seeing Fonda in anything. Henry Fonda finally co-starred with his daughter Jane in On Golden Pond (released in December, 1981). Jane had bought the screen rights to the play in the hopes that her father would play it; the role won him the Oscar for his performance. Too ill to attend the Oscar ceremony, daughter Jane accepted on his behalf. Fonda died of heart failure at his home, surrounded by his family on August 12, 1982. He was 77 years old. Grauman's Chinese Theatre, Hollywood, California. Henry Fonda Forecourt ceremony, Friday, July 24, 1942. 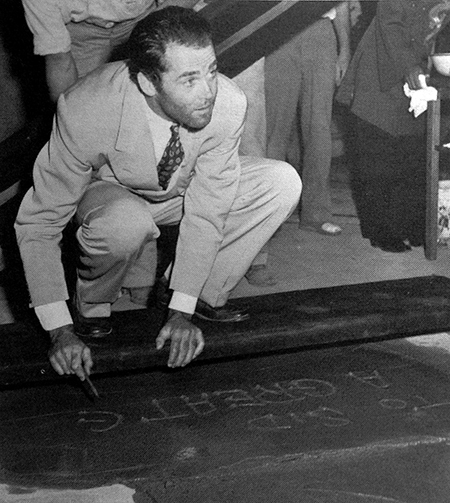 Henry Fonda pauses while making his inscription in the cement. Grauman's Chinese Theatre, Hollywood, California. Henry Fonda Forecourt ceremony, Friday, July 24, 1942. Sid Grauman presides over the co-stars of the film Tales of Manhattan: Henry Fonda, Charles Boyer, Rita Hayworth, Charles Laughton, and Edward G. Robinson.